The only surviving member of his murdered family, Nobody Owens was raised by ghosts. As you can imagine, Nobody eventually wishes to leave the graveyard and explore the big world, only to find that in the real world, there’s no place as friendly as your neighborhood graveyard. My library has The Graveyard Book in just about every format to be found and I tried to sample them all. In the end, I decided to try out these Playaway thingies. My Mom has told me about them at her library, but I’d never actually seen one before now. I liked that there was an option to speed-up or slow-down the audio, and that it was read by the author, so I decided to give it a shot while also making note of the many other formats in existence (the illustrations by Dave McKean looked fantastic). 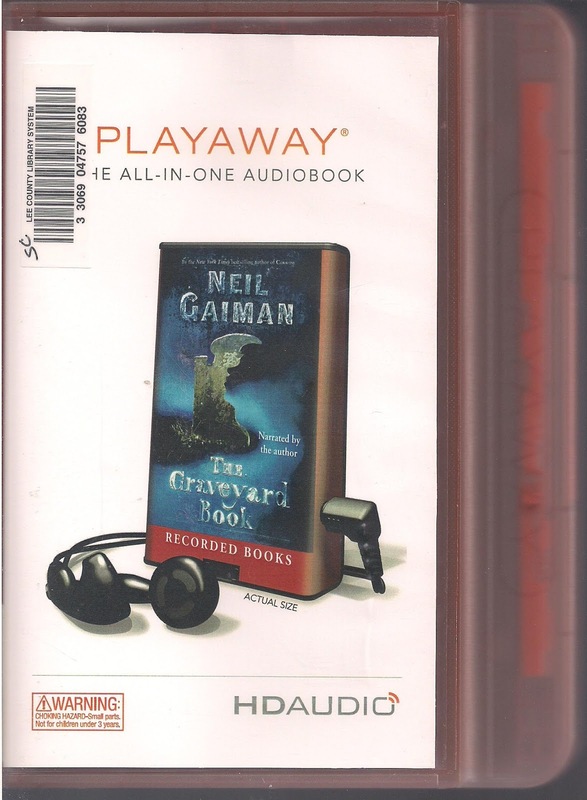 I’m glad I chose the Playaway device (a counterintuitive use of an mp3 player) because although the faster speed setting wasn’t to my taste, just hearing Gaiman read “flibbertigibbet” at what was descriptively labeled “speed ++”, was well worth the price of admission. Going into this book, I knew next to nothing about it. Since completing it, I’ve seen The Graveyard Book oft praised for inspiring a sense of wonder. Well, it certainly starts out promising. The title alone is about as ominous as the Hugo’s come (maybe right behind Doomsday book). We are immediately introduced to a toddler who has only narrowly escaped the clutches of “The Man Jack” (another threatening title), who murdered his family for an undisclosed reason. 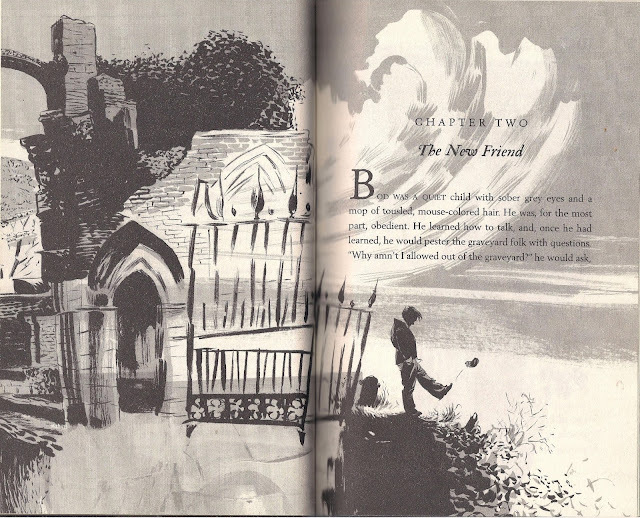 The first chapter ends when the boy is rescued, at the behest of his recently dead mother, by a graveyard full of very unthreatening ghosts. The rest of the book cobbles together an uninspiring hero’s journey, never managing to live up to the possibilities suggested by the title and first chapter. Gaiman notes that it began as a re-telling of The Jungle Book, but I just didn’t find it to be much of an improvement. This is a book with an orphaned protagonist, ghosts, ghouls, and a murderous evil dude, from the 2000’s and it’s not Harry Potter. The fact that it is still well-known and well-loved is impressive. However, beyond the neat concept, the story lacks any robust development and it never mattered to me whether Bod would ever see Scarlett again, whether he’d get out of the graveyard permanently, or whether anything in particular would happen at all. The graveyard ghosts fell flat for me and Nobody Owens was one the most flat characters of all the Hugos. I might have cared about The Man Jack for a minute…but then I stopped at the uninspired “Jacks of All Trades”. The Harry Potter series, for all its faults, had readers invested in not only Harry, Ron, and Hermione, but in the Hogwarts Castle, secondary characters and the compendium of magical beasts and intricacies of the previously unknown magical world. Compared, The Graveyard Book is just the most beautifully wrapped and enticing gift under your Christmas tree that upon unwrapping turns out to just be a second pair of boring pajamas. Gaiman has a very recognizable voice. I’ve only read The Graveyard Book, Coraline, and I’ve heard him read a handful of things on the Youtube, but even this small sample has demonstrated an instantly recognizable author’s voice. He tells The Graveyard Book in much the same way that he addresses a graduating class. I happen to like that he approaches all of these with the same level of care for the construction and tone, so it’s fair to say that despite a fairly strong disconnection from the characters and events in The Graveyard Book, the vehicle in which it was told was truly pleasing. But that’s not the voice I mean to talk about. I mean to say that his voice – his speaking voice – is just wonderful. If I were a contestant on one of those old dating shows where the bachelors are screened from view and they answer inane questions and whatnot and Neil Gaiman were one of the bachelors, his voice would totally be my pick. He has the sort of voice that can perfectly convey the sense of wonder (I’ll admit there is a little more than none), of silliness, but also of the grave things that only a children’s story might contain all at once. The combination of his distinctive brand of storytelling and a rather natural voice-acting ability (the man knows how to pause like nobody’s business) created a children’s story that can fill the room. I’m aware there are a great many people out there that enjoyed this book more than I did and I imagine for those who did, listening to Gaiman read it himself will just wreck them. This has been one of my most favorite audiobook experiences thus far. The only other complaint I’d pass on here, was that it seemed to have such a deficit of emotion (and a story about an orphaned child should have been easy) that I never felt much about it at all. Honestly, the 2009 nominees included some pretty big names (Charles Stross, Cory Doctorow, John Scalzi, and Neal Stephenson), and it seems unlikely that this one pulled out the win. It was fun at times, but mostly just seemed uninspired. If my daughter were reading now, this would be pretty hard to suggest given the dearth of amazing SF/F for kids in existence. After initially deciding not to listen to any more audiobooks for the remainder of the challenge, the time it is taking me to finish Jonathan Strange & Mr. Norrell is forcing me to. So while I continue with that beast, I'm also listening to Harry Potter and the Goblet of Fire. I don't even remember what I was saying last night when your blog kept eating my comments. Something full of righteous indignation that you didn't enjoy this, but then I blamed it on the fact that you listened to the audiobook because IT NEEDS THE ILLUSTRATIONS. CAPATTACK RAGE TO REPLACE WHAT WAS LOST! Always with the shouting. What is the most appropriate response to "CAPATTACK RAGE"? "Underline Parry" or a "Strikethrough counter spell"? Sorry your original shouty was eaten. Being peripherally aware of the illustrations, I don't doubt that you are right. Still, Gaiman read it pretty well and despite being pretty, I still wasn't feeling it. I just wanted it to be over the whole time. Hee! Either would work well, I think. I totally understand the sentiment, I feel that way about a lot of books. Pretty, but not for me (like all of Austen's work). I agree! This is one book to be read, along with the illustrations. I loved it. Well, when Emmeline is old enough for it in a few years, maybe it will be the perfect time for a re-read...with illustrations this time! I just finished this book a few days ago and loved it. However, I don't see why this, Harry Potter, Jonathan Strange, or Yiddish Policeman's Union should be Hugo winners. Yiddish, maybe, under the category of alternative history, or speculative fiction. But Potter, Graveyard and Strange are straight up fantasy. I just squeezed in Azimov's "On Science Fiction", and found his disdain for soft s.f. and speculative fiction parochial and irritating. But I think these books are pushing the boundaries of what is and isn't science fiction w.r.t the Hugos. I think they are better suited for the Locus award, which covers both s.f. and fantasy. To be clear, I loved Potter, Graveyard, and Strange, but should they have been nominated for Hugos? I hope I'm not opening a can of worms here. Sorry, I'm retracting this rant. In perusing the Hugo official site, I found their statement that fantasy is included and eligible. I definitely feel silly now. Retraction noted. I was meaning to respond to you though because even though it's allowed, the 2000's marked a serious push for fantasy and I agree, they weren't all great. 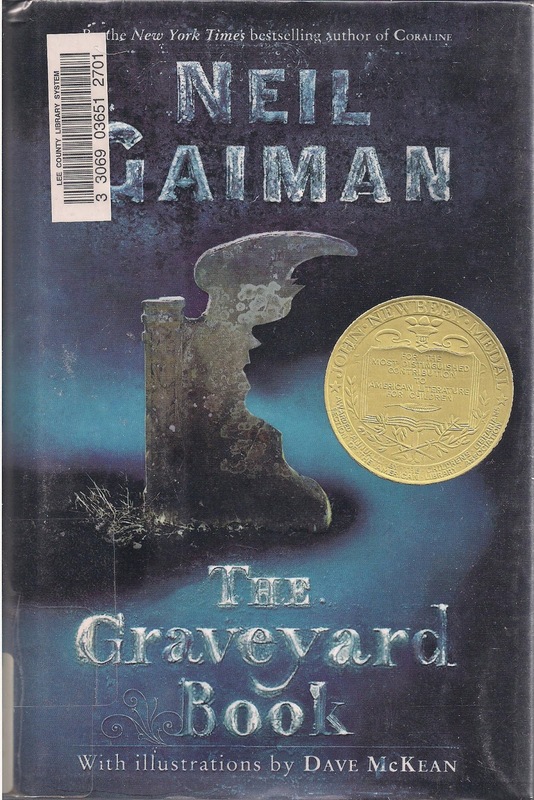 Gaiman is a wordsmith; not the best out there, but I think he offers some really worthwhile moments in the current world of children's and YA literature that often feels written by amateurs. It's not my FAVORITE story for kids...but I connect with something that can be read by kids but still treat kid things in mature ways. Gotta agree with SJ that the illustrations are important; probably not so necessary as in The Invention of Hugo Cabret, but definitely better and more effective than in Jonathan Strange. Which I'm still hoping you review, by the way. I guess I wrote this a little over a month ago now and in that time, I've come to think that if this book had been around when I was younger, I might have been more ready for it. It still isn't my favorite of the few Gaiman stories that I've read, but like you say, it isn't my favorite, but there is definitely a connection there.